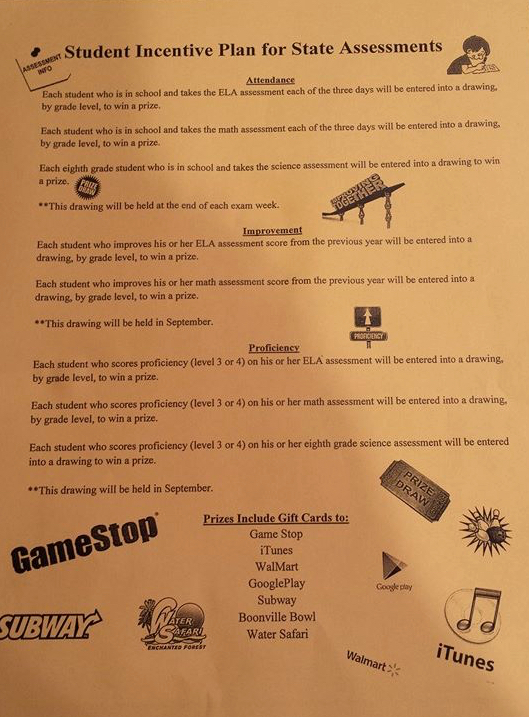 On February 27, 2015, a parent of a middle school student in the Adirondack Central School District (ACSD) shared this photo of an Incentive Plan for State Assessments that was given to her child during English class after a spiel by the principal. The “Incentive Plan” has already received a huge amount of attention both locally and across New York State. The Utica Observer Dispatch ran this article yesterday around 5:00pm. Adirondack school incentive program criticized. Parents are outraged and as conversation heated up on social media, more information about “the plan” was shared by parents from ACSD. In addition to the incentives offered, students were also offered breakfast and candy bars in return for their participation in NYS tests. Students were also told that their eligibility for advanced placement programs would be in jeopardy if they did not participate. The fact that school leaders have resorted to bribing and coercing students into participating in exams speak volumes as to the misguided agenda of Governor Andrew Cuomo who continues support this culture of “test and punish” while withholding state aid runs until his education reforms are approved by the NYS legislature. . Things didn’t work out so well in New Jersey. Pressure from the community forced the Morris Hills Regional District to offer an apology. To make certain that Adirondack Central Schools do the same, Opt Out CNY is calling upon its members and the general public to share their thoughts with district officials. Contact information can be seen in the “Action Alert” to the left, and is also available below. How do we make certain that this type of bribery never happens again? *Refuse to participate in the tests. *Support NYS Assemblyman Jim Tedisco’s legislation that would ensure “…students are not punished or rewarded for their participation or lack thereof in the exams ” as well as require that school districts notify parents that their children have a right to refuse NYS grade 3-8 Common Core aligned Math and ELA exams. While the Adirondack region prides itself on its beauty, history, and traditional way of life, the Adirondack Central School District is clearly behind the times. We invite them to join Opt Out CNY, a growing coalition of over 1,800 students, parents, educators and school administrators who advocate for children, ensure that our schools remain a safe place where all students feel welcome, and speak out against education reforms intended to privatize our public schools. We, your constituents, reached out to you this past week to ask for your help in defeating Governor Andrew Cuomo’s destructive proposals regarding public education. NONE of the education proposals contained in the Governor’s current “lost” Opportunity Agenda are good for kids. When we speak with you or representatives from your office, we are told that we simply must accept, on behalf of OUR children, certain parts of the Governor’s plan and that “it’s just how things work in Albany.” We’re told that “there are many legislators who want more charter schools.” We’re told that many of the same legislators want to see the inappropriate tests that we give to our children, some as young as 8 years old, count for MORE. Senator Griffo, you were elected by the people in our voting district to represent OUR best interests, not the best interests of your legislative counterparts or people that they are beholden to. What sort of leadership looks at a child and says to that child that his or her test score will no longer account for 20%, but 50% of the factors which will determine whether or not their teacher will have a job the following year or, even worse, if their school will re-open? Senator, if you want your legacy to be one which allowed for people from outside of your voting district to determine how you represented us and our children, you’re well on the way to achieving that. However, if you want to be seen as a champion for all children in real public schools, I believe that the many calls and letters you’ve received from us will serve as an outstanding guide.